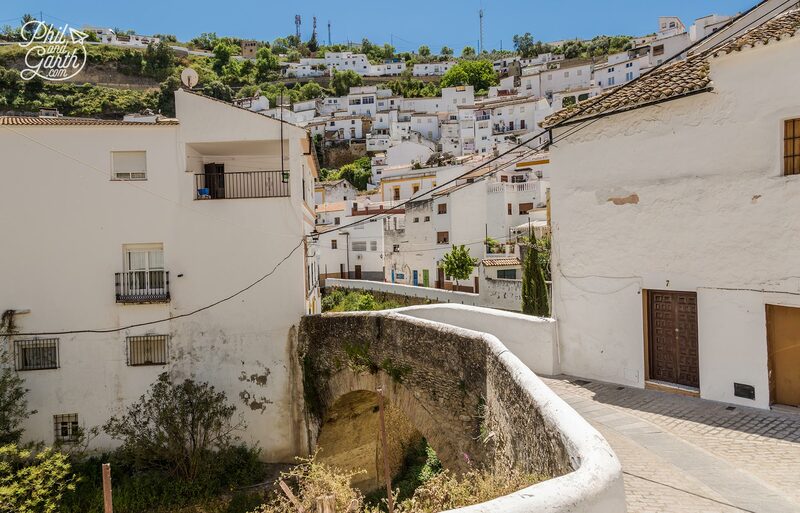 You may have heard of Southern Spain’s ‘White Towns’ of Andalusia, characterised by their hilltop locations and ridiculously pretty white washed homes. 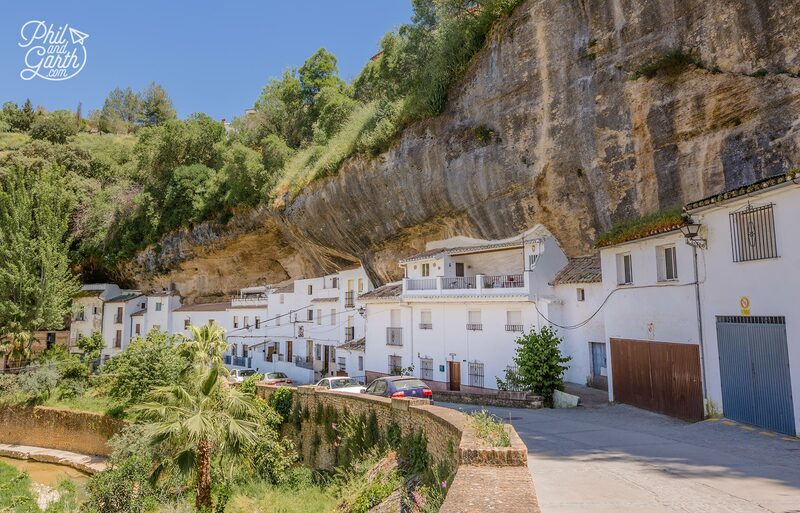 Well Ronda is probably the most dramatic of these towns but did you know just 30 minutes away lies another equally striking White Town? 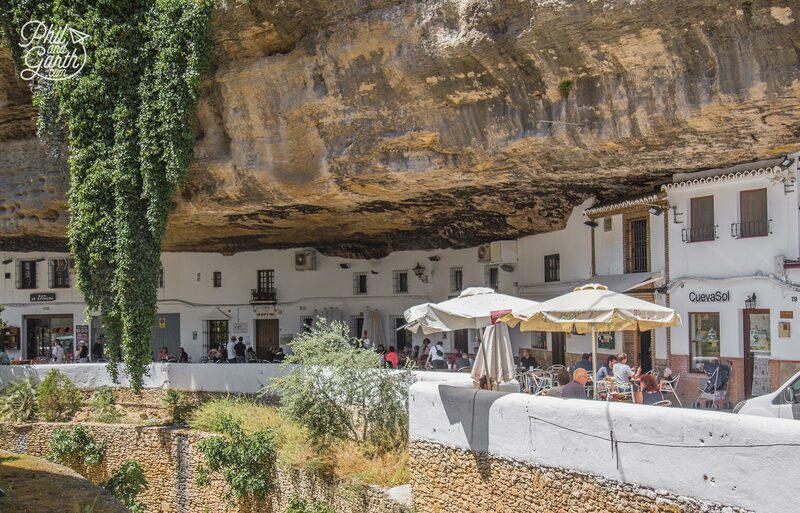 It’s called Setenil de las Bodegas – a unique place where people live under rocks. 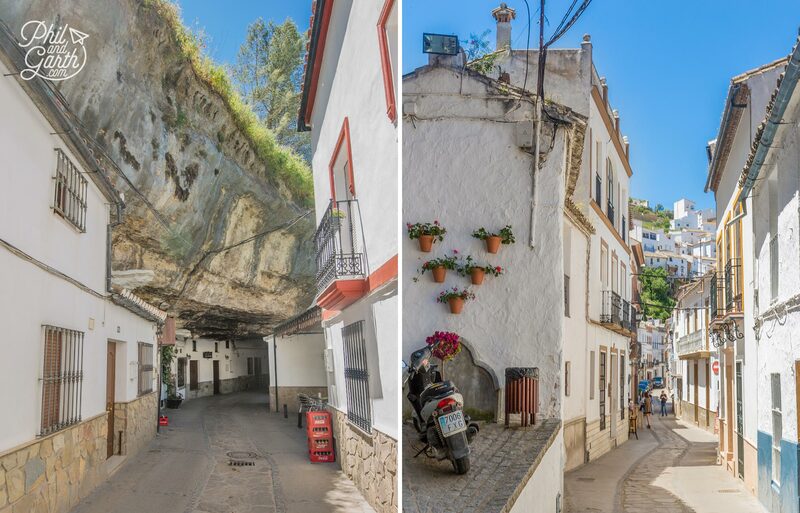 It’s an extraordinary sight where many of the town’s homes are built underneath huge rock overhangs. About 3,000 people live here, some in these ancient caves, where it’s believed the first residents arrived 12,000 years ago during the Stone Age, then through to Roman times. However when the Islamic Moors arrived 1,300 years ago they built a modern fortified town with a castle and also took advantage of the cool caves and areas under the rock to store goods. Today you can visit the restored tower of the old castle. 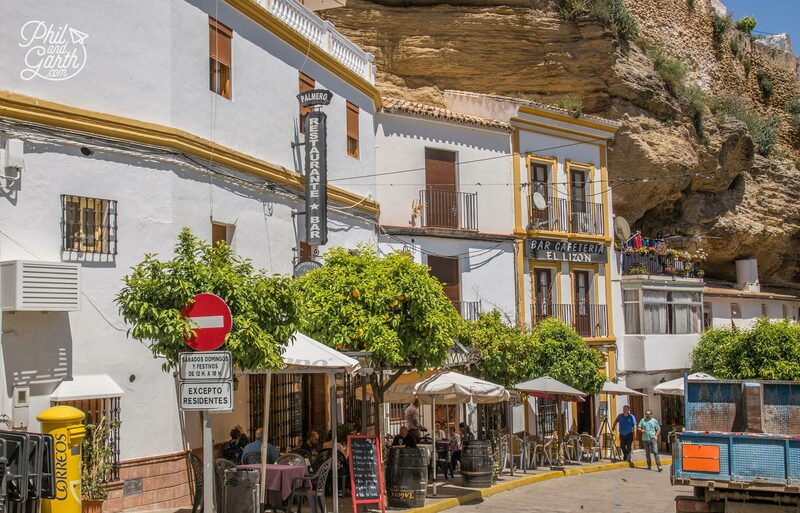 There are two main streets to explore – ‘Sun Street’ and ‘Shade Street’ which run parallel to each other on the banks of the River Guadalporcún that runs through the town. 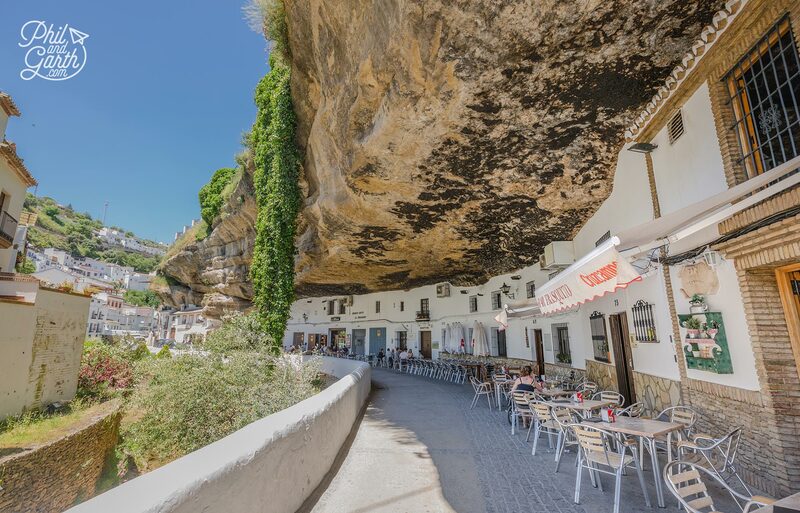 It’s astonishing looking at the homes sculpted directly in the rock, they are not actually carved into the rock, instead people have built just a front wall – a facade under the natural overhang with the caves forming the interiors of their homes. Sun Street is lined with various restaurants and tapas bars. 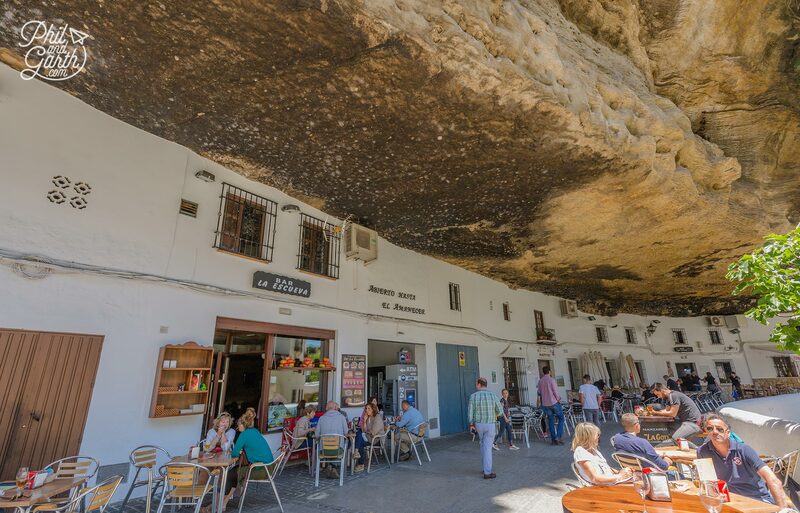 It’s worth taking a peek inside some of the bars to see these surreal interiors – the rock is their ceilings and walls, we thought some of the bars looked like pubs straight from medieval times! We sat outside Bar Frasquito for lunch and ordered a few tapas dishes including a plate of fried fish, nobody spoke English so we tried our best pigeon Spanish! What arrived was huge portions and very generous for what we thought were tapas dishes because they were reasonably priced, oh well we still managed to scoff everything! whilst watching the birds flying around the overhanging vines. Cross over the river and you’ll find ‘Shade Street’ there’s lots of nice craft and foodie shops to browse around here. 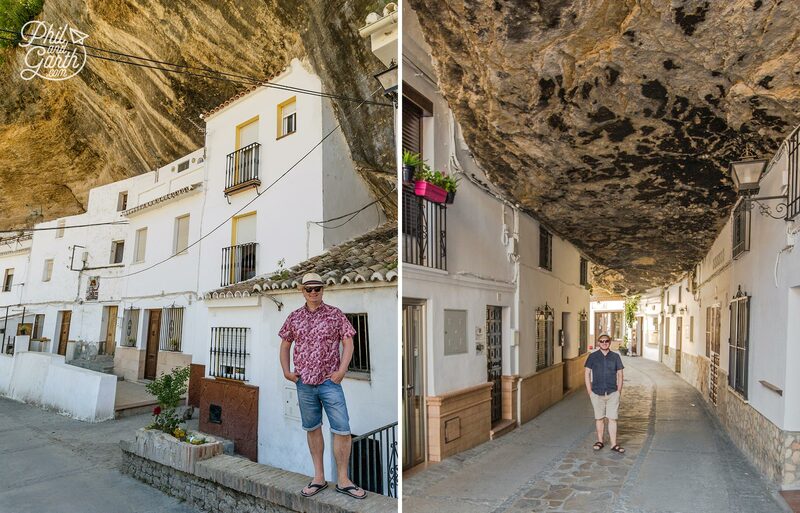 Part of the street is more like a tunnel where giant boulders create a natural ceiling. 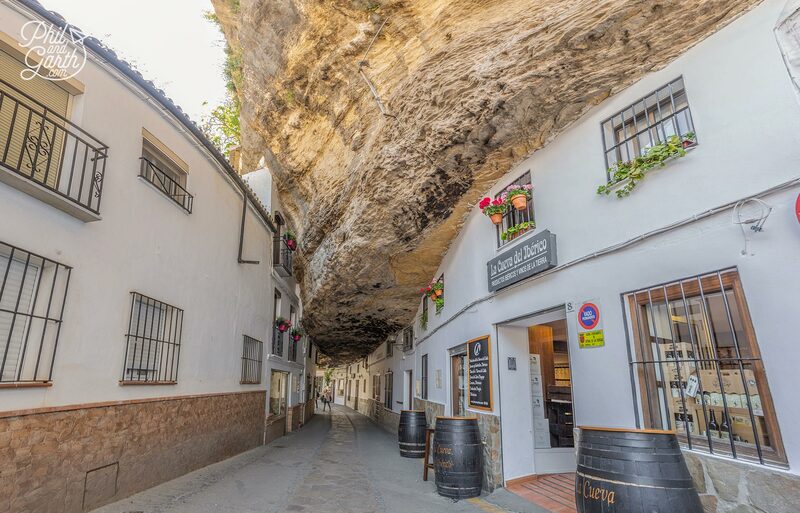 Make sure you stop at the deli shop – La Cueva del Iberico, it’s inside a cave where we took advantage of the free cheese and wine samples. Apparently Setenil de las Bodegas is famous for chorizo and wine, we also saw places selling marmalade, must be because of all the juicy oranges grown in this region. Once you’re done with Sun and Shade streets walk down Calle Jabonería which leads you to a Roman Bridge. Along the way it’s a delight just wandering the narrow streets, every nook and cranny has been filled with a home. Buildings are painted white to reflect the scorching summer sun to keep temperatures inside cool. 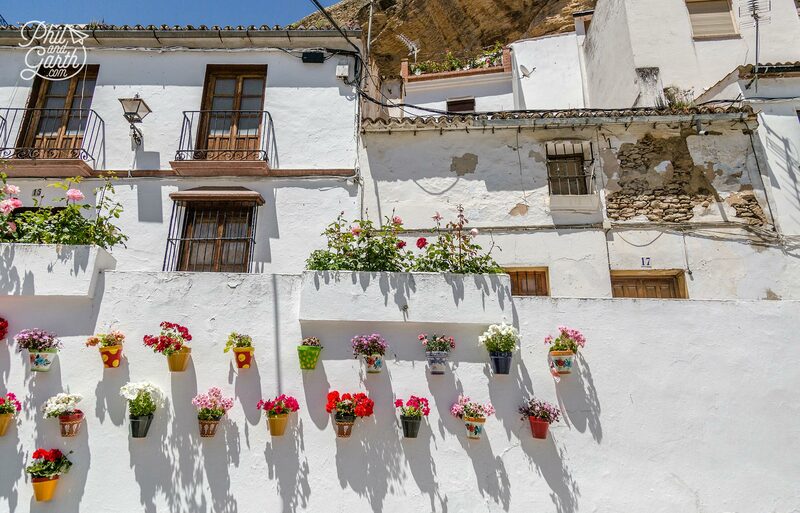 The quirky homes are so picturesque, especially with potted geraniums decorating doorways. Oh and if you love taking photos of doors, then you’ll be in your element! there’s lots of old ones to choose from. 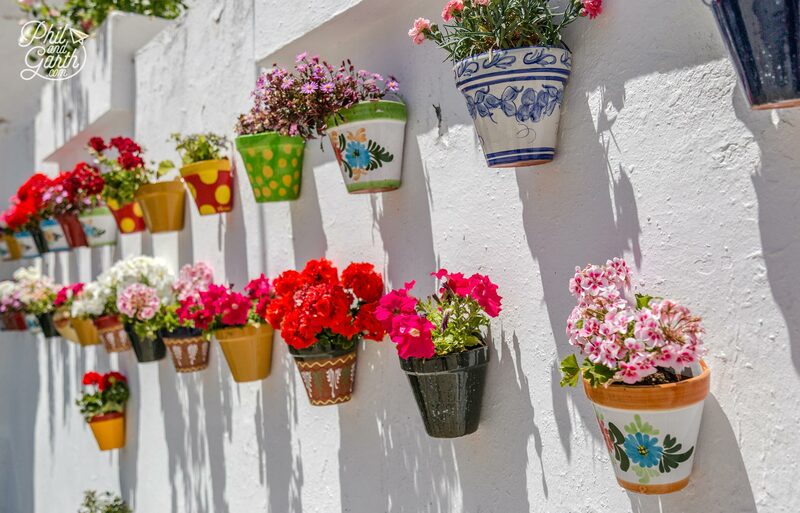 Love the decorative painted pots! Just like many of Andalusia’s white towns, Setenil de las Bodegas has been occupied by the Romans, Moors and Christians over time and the architecture reflects this, we passed an old mosque that had been converted into a church. Don’t worry about getting lost, there are signs up with a camera icons pointing you to certain streets if you get stuck. 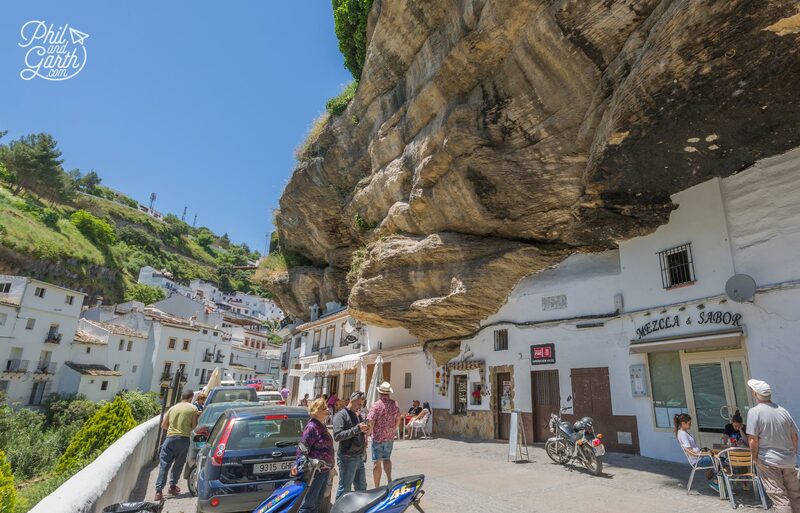 We loved soaking up the peaceful atmosphere of this authentic Spanish town. End your visit to Sentil de las Bodegas by heading up to the highest point to see the restored Nazarí Tower. It’s the only remaining tower of the former Moorish castle, next door you can also visit the imposing Church of the Incarnation. 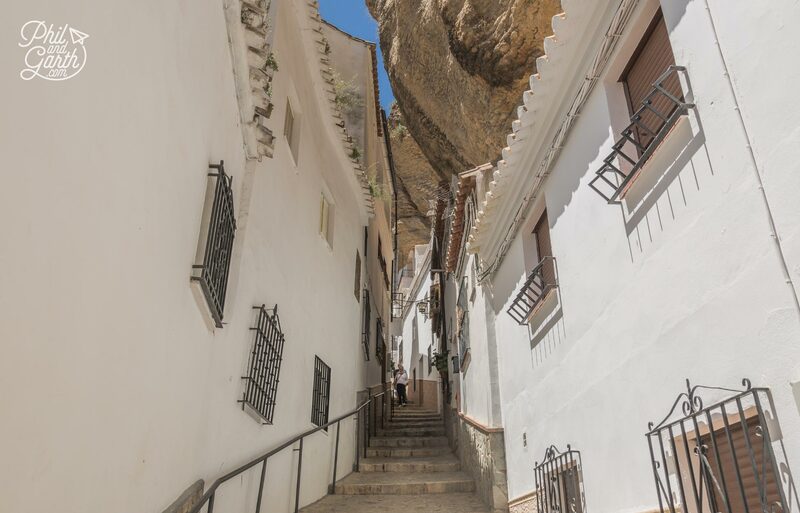 It’s a steep walk to the top in places but worth the effort, on your way up make sure you find Calle Herrería, the town’s oldest street which leads to Plaza de Andalucía – a picturesque square which has a couple of restaurants. We tried to order some coffee on some of the outside terraces, but told we could only stay if we ordered food. 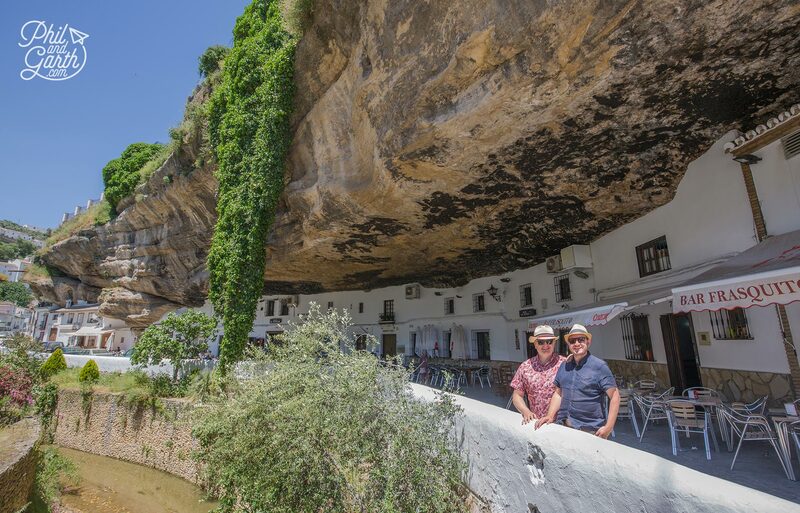 We loved visiting Setenil de las Bodegas, it must be the most unique of Andalusia’s White Towns or ‘Pueblo Blancos’. 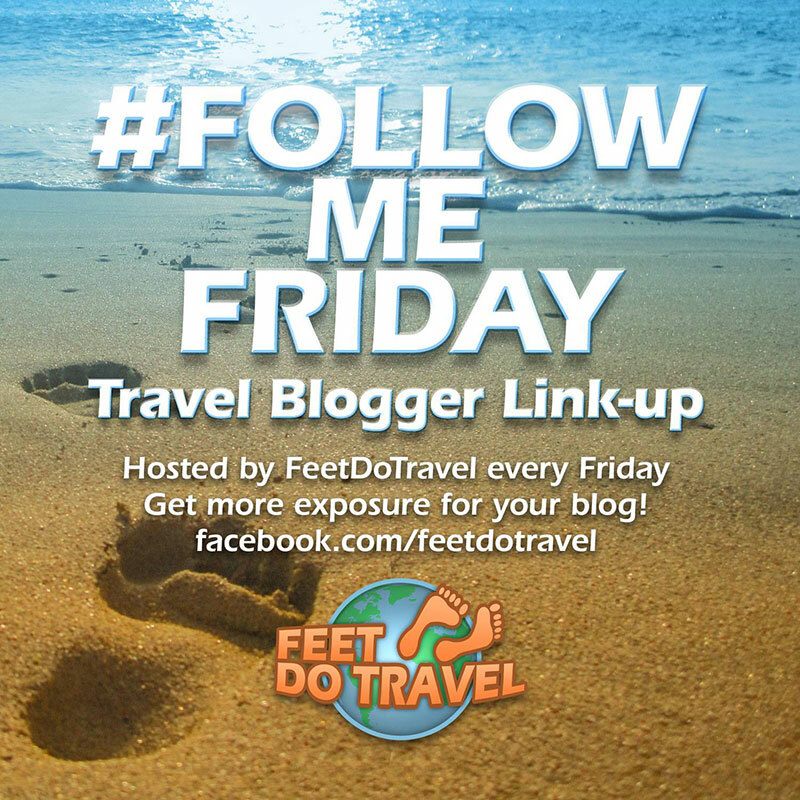 It would make a great day-trip if your staying in popular Malaga or Cadiz. 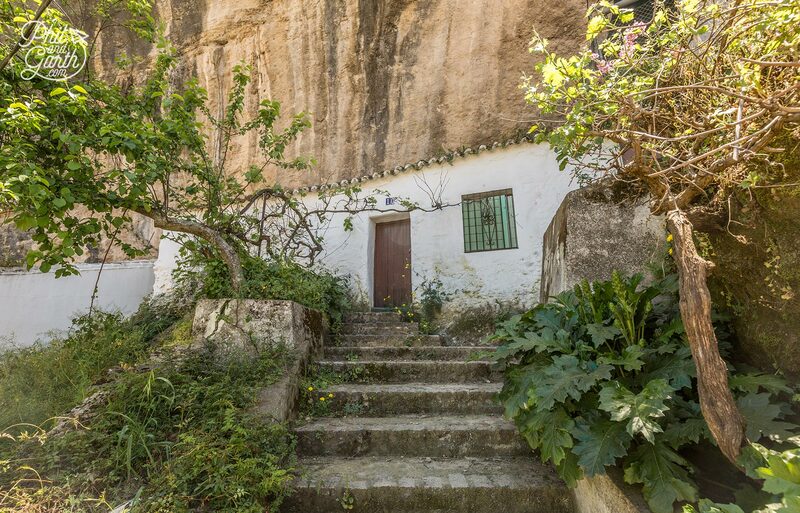 Or if you’re staying in Ronda then it’s definitely worth a detour as it’s so close, a 30 minute drive or there’s public transport buses. You’l pass some amazing olive farms and valleys on the way. 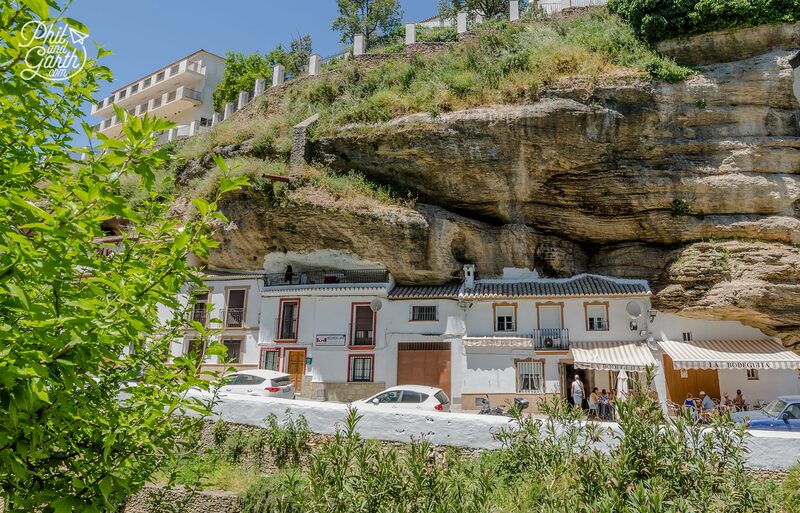 Ronda – Perched on a somewhat terrifying but spectacular huge gorge. 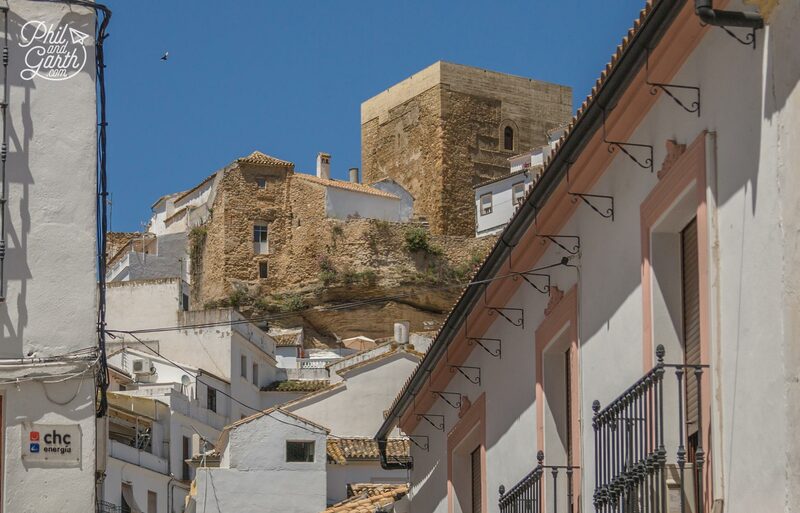 Casares – Has a huge Moorish Castle and Roman baths. Gaucin – Views to Gibraltar and the Rif mountains of North Africa. Ubrique – Famous for high quality leather goods. 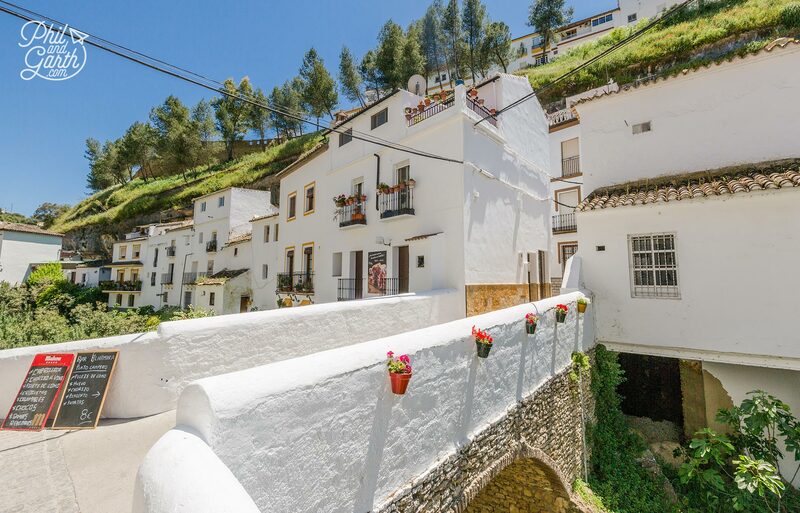 Grazalema – It’s the whitest of the white towns. 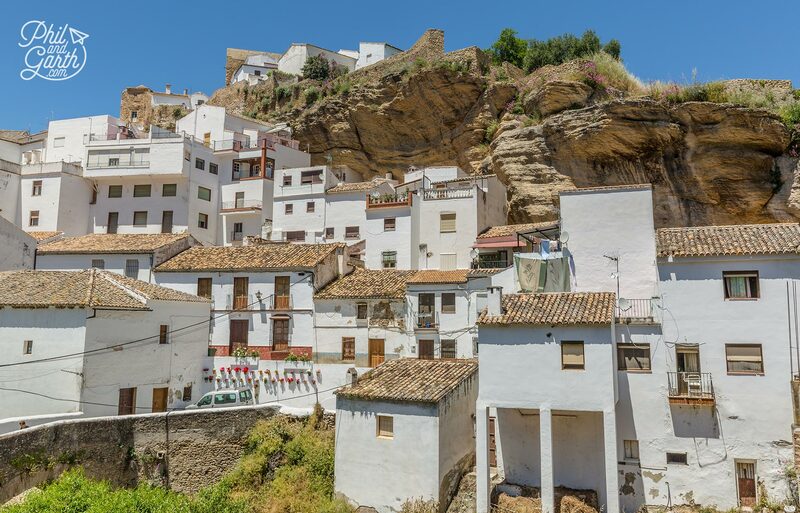 Zahara de la Sierra – Views of green valleys and turquoise lakes below. 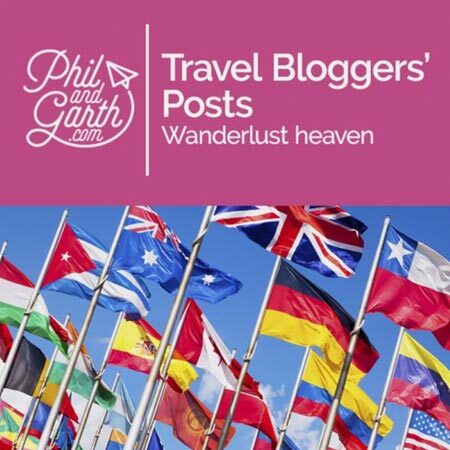 Arcos de la Frontera – Dramatic setting and not overly touristy. 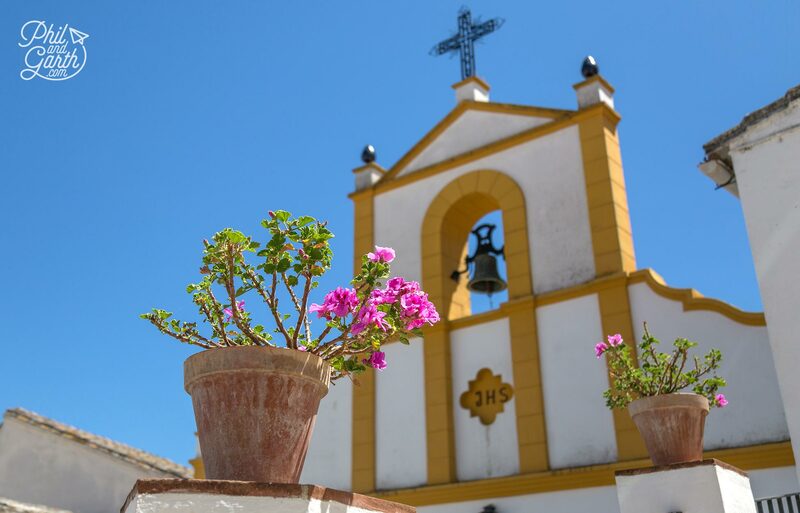 Olvera – Imposing Church and Moorish Castle, also sells the region’s best virgin olive oil. 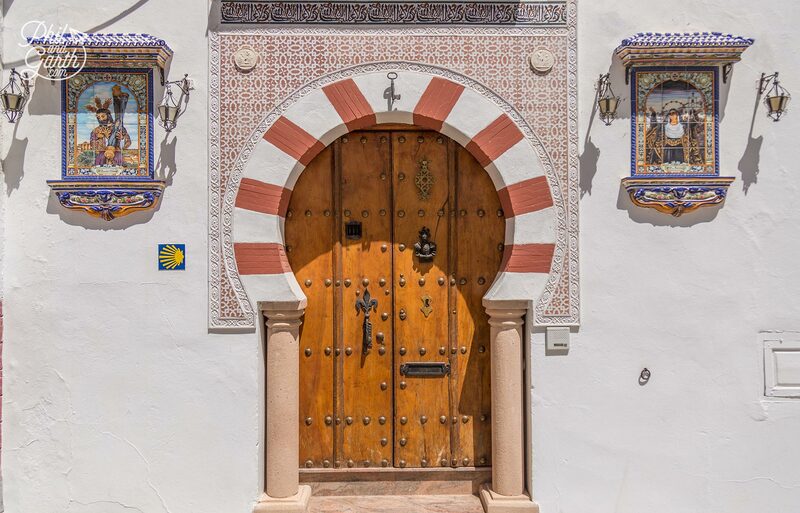 Vejer de la Frontera – Lots of Islamic influences here, it has a Moroccan vibe. Tip #1: Don’t even attempt to drive into the town as you will get stuck – park just outside and walk in. Tip #2: Take a photo of the map near the bus station so you can refer to it as GPS on Google Maps is hit and miss. Tip #3: It’s not a very practical place to explore for the elderly or wheelchair users because of the steep steps. Tip #4: If you have a DSLR take a wide angle lens or use a GoPro to get the best pics on Sun and Shade Streets. Tip #5: Don’t expect everyone to speak English as they don’t, so brush up on your Spanish phrases! Great Video of such an amazing town that has settled into the side of the mountain. A place where I would love to visit. 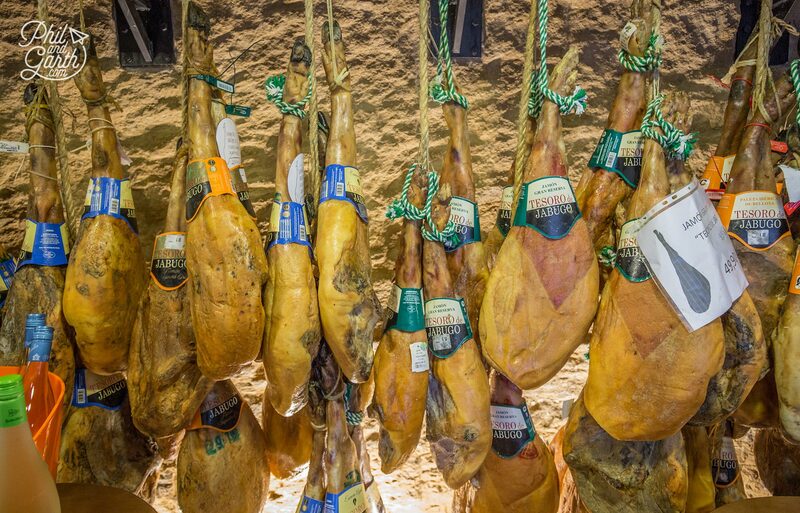 How interesting that it is known for chorizo, wine and marmalade. 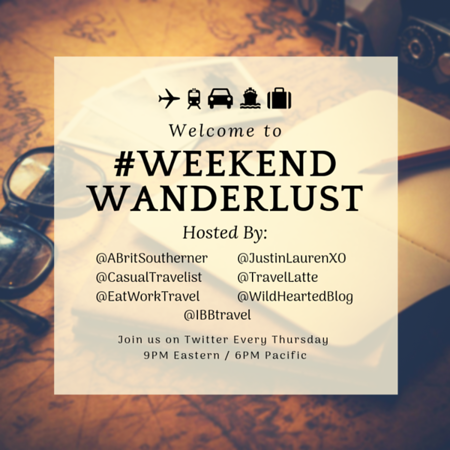 I will definitely pin this for me to take a visit there. Wow — how awesome! I thought it was a figurative “rock” and here is a literal huge rock over the town. What a great place to visit!